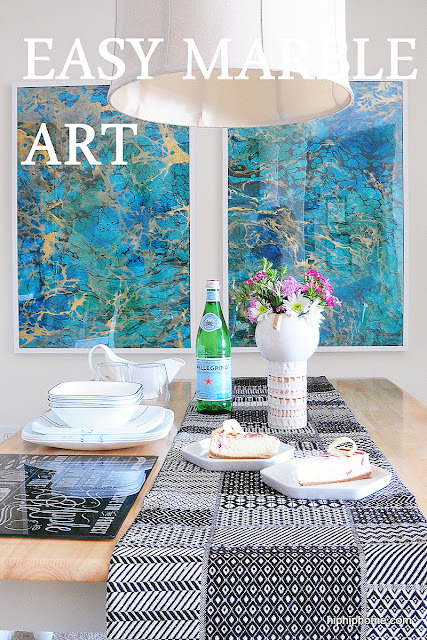 EASY FRAMED MARBLE ART - HIP HIP HOME! Our dining room is more of a nook, and we hardly eat out there so decorating it was never a priority. We recently made a few simple changes like changing the light fixture and finally adding some art. Let me tell you a bit about the artwork. It's a DIY where the doing actually means driving. I love a good natural pattern like that of marble and agate. I remember having seen framed marbled art on Pinterest. So after relentlessly pinning it, I finally got to doing it! I first read about this on the TheDecorfix blog. So thank you Heather, for the original idea! First, I went out and bought marbled paper from Paper Source. They market it as fine paper, and you can see it online as well as in the store. However, I strongly recommend going to the store to check them out 'cos its a visual treat. I must warn you though, their collection is just gorgeous and you will go through the long process of having to select JUST ONE. It's painfully cruel I tell you. Finally I ended up buying this beautiful, crinkled, hand-marbled greenish-blue paper with streaks of gold and black. I then put them in IKEA Ribba frames (one of my favorites), and simply hung them on the wall. Easy-peasy artwork! (Well not so easy, hanging those RIBBA frames is quite a pain). I think they would also look stunning in gold frames. I decided to forgo the mat, to show off as much of the paper as possible. I love it so much! I am often staring into it and it's my current favorite thing at home. The natural marbling and the green gives it an almost oceanic look. Now we have a reason to actually eat at this table! What do you think? It looks so bright and mod with the art! Love it! I had such a hard time choosing from all those colors, but I'm finally happy. Well I think no matter which one I picked I would have been happy ha ha, cos they are all gorgeous! Marble has been a trend for quite a long, but I am glad to see this blue with gold veins in use. Love it! Here via designsponge... you have a lovely home! What a great project! An easy way to make a huge impact! What size was the marbled paper! Hi Nicole! The paper is 20''x30'' . I just updated the article with a link to the item.